Motor: 2 h. P. , 220 v, 50 hz. We are offering Automatic Soap Packing Machine to our client. We are offering a wide range of Detergent Cake Packing Machine. We are offering Detergent Soap Wrapping Machine. 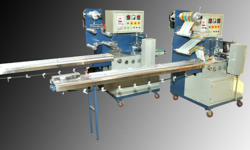 We are offering a wide range of Soap Pack Machine. - This machine also use to pack single piece product like cup cake, slice cake, soap, IV Bottle or switch etc. We have carved a niche amongst the most trusted names in this business, engaged in offering a comprehensive range of Soap Packing Machine.
. Power Transmission by Servo Drives.
. 200 pieces per minute production rate.
. Change over time less than half an hour.